Israeli soldiers resorted, Friday, to the excessive use of force against protesters across the occupied West Bank, including Jerusalem, and the Gaza Strip, injured and abducted many protesters, as the weekly processions continue for the 14th consecutive week against the illegal U.S. recognition of occupied Jerusalem as the unified capital of Israel. One Palestinian suffered a life-threatening injury in Hebron. The soldiers assaulted the protesters with clubs and batons, in addition to firing dozens of live rounds, rubber-coated steel bullets, gas bombs and concussion grenades. Medical sources said many Palestinians were shot with live fire, rubber-coated steel bullets, and dozens suffered the effects of teargas inhalation. In Hebron, in southern West Bank, the soldiers shot and seriously injured a young Palestinian man in Bab az-Zawiya area, in the center of the city. The young man was shot with a live round in the chest, before he was rushed to Alia governmental hospital. In occupied Jerusalem, the Israeli police and soldiers abducted two young Palestinian men, and confiscated the car of one of them for organizing a Palestinian Marathon to counter the Marathon the City Council is holding for Israeli colonizers and internationals. In Ramallah governorate, in central West Bank, the soldiers shot two Palestinians with rubber-coated steel bullets and caused dozens to suffer the effects of teargas inhalation in the al-Mazra’a al-Gharbiyya village, northwest of the city. The Palestinians marched towards lands (4000 Dunams) the army intends to illegally confiscate to pave a new road linking the illegal colonies of Telmon, Halamish and Ateret, with each other. The soldiers also targeted many journalists and medics with gas bombs, causing some to suffer the effects of teargas inhalation. In Salfit, in central West Bank, the soldiers shot two Palestinians with live fire, and injured several others with gas bombs and rubber-coated steel bullets. Many Palestinians also suffered the effects of teargas inh alation at the northern entrance of the nearby city of al-Biereh, after the soldiers attacked them with a barrage of gas bombs, and rubber-coated steel bullets. Nonviolent protests were also held in Bil’in and Ni’lin villages, west of Ramallah, in addition to Deir Nitham and Nabi Saleh, north of the city. In Qalqilia, in northern West Bank, the soldiers attacked the weekly procession of Kufur Qaddoum town, and tried to ambush many protesters in Palestinian Olive orchards, in addition to firing many gas bombs and concussion grenades, causing several protesters to suffer the effects of teargas inhalation. The protesters were marching against the ongoing Israeli occupation and colonialist activities and demanding the army to open the main road which was blockaded by 14 years ago, to enable easy access to illegal colonizers driving to and from Kedumim colony, which was built on privately-owned Palestinian lands. 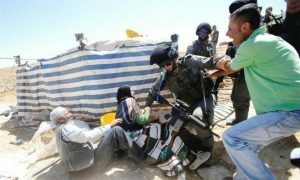 Furthermore, the soldiers attacked protesters in the al-Lubban ash-Sharqiya village, south of the northern West Bank city of Nablus, after many colonizers tried to occupy Palestinian lands in Jabal al-Ras area, near Maali Lavonna illegal colony. The villagers managed to remove the colonizers, and burnt the tents, which were earlier installed under heavy Israeli military protection. The soldiers fired several gas bombs, wounding many Palestinians, while local youngsters hurled stones at them. Medical sources said the soldiers shot two Palestinians with live fire, in the lower extremities. Furthermore, a group of colonizers attacked Palestinian homes in Einabous village, south of Nablus, before locals started hurling stones at them. Israeli soldiers then invaded the village, and fired many gas bombs at the Palestinians, causing many to suffer the effects of teargas inhalation. In addition, the soldiers attacked protesters in Jericho, and closed its southern entrance. In the Gaza Strip, the soldiers fired a barrage of gas bomb and concussion grenades, in addition to live fire and rubber-coated steel bullets at dozens of protesters, who marched on Palestinian lands near the border fence. Eyewitnesses said many armored Israeli military vehicles, and tanks were deployed near the fence, before the soldiers opened fire on the protesters. 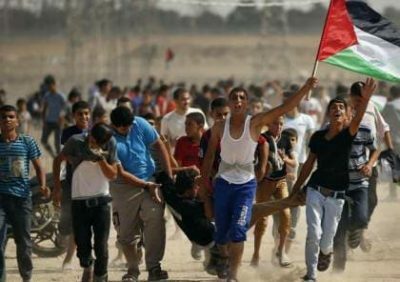 Medical sources said the soldiers shot five Palestinians east of Jabalia, in northern Gaza, one east of Gaza city, two east of al-Boreij, in central Gaza, and two east of Khan Younis, in the southern part of the coastal region. Earlier Friday, Israeli planes sprayed Palestinian farmlands close to the border fence, with toxins, to kill the plants which “would conceal the Palestinians, who might approach the fence,” according to the army. It is worth mentioning that the military frequently invades and bulldozes Palestinian lands, close to the border fence, installs sand hills, in addition to repeatedly spraying them with toxins.